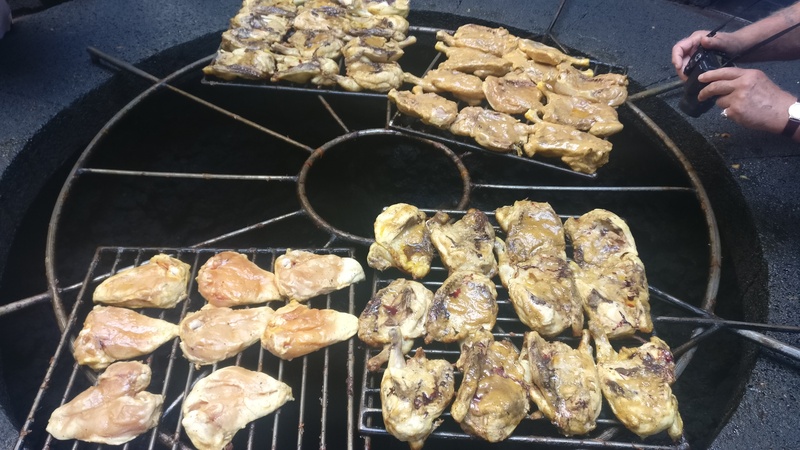 It’s not every day that your lunch is cooked using the heat from a volcano. Well, maybe it is. If it is, then I expect that the novelty has probably worn off by now, and right now you’re rolling your eyes and sighing theatrically. Fine, be like that then. No comments yet, but you can change that. Man with accent which I can’t place: Herble flerble doobie sprobble? MWAWICP: I said, are you Ukrainian? MWAWICP: I ask because of your beard. MWAWICP: Yes, your beard. I know man with beard not like yours, he not Ukrainian. But I also know man with beard like yours, and he Ukrainian. So I wonder if you also Ukrainian. Me: … … You have a good holiday now pal. I must apologise for my dreadful behaviour when I visited your house recently with my family last night in my dream. Firstly, it was a delight to finally see your house after all these years, after being able to only imagine it. I was a little surprised that it bore such a striking resemblance to the house in Leicestershire that my grandmother used to live in. I am deeply sorry that my disagreement with Karen caused me to lose my self control, pick up a bunch of flowers and use it to bludgeon your furniture. It was petulant and indefensible. I have always prided myself on being able to discuss my feelings openly and I will make sure that this event was a one off. While I stand by my promise to pay for any damage caused, I was clearly acting rashly when I handed you a wad of £20 notes adding up to exactly £1000. Given that flowers are soft and I only dealt one blow, it would seem likely that this was an excessive sum, and I honestly don’t know what possessed me. I’m surprised that I even had that amount of cash on me. Once you have paid for any required repairs, please could you return whatever is left to me. Finally please could you pass on my apologies to your family, and your other visitor who I met while we were leaving. He seemed like a lovely man, and please could you let him know that I wasn’t really intending to ram into his car with mine, it was merely the remaining vestiges of my fury speaking, and my frustration that he would block my car in on your driveway with his own, while fully cognisant of the fact that he wasn’t going to be able to start it again. This still seems to me like a very inconsiderate act, though I stress that I am in no way making excuses for my appalling conduct. Vaughan was a member of our Uborka community all the time that it was active, and one of those people who drifted but never felt too far away, when blogging stopped being a thing. We at Uborka were sad to learn of his death. It’s 12 years and about 3 months since we put in the offer on our house. There were many features that we liked, including the garden, the proximity to the train station, the infant and junior schools just around the corner, and many more. When we were looking around it, we earmarked one particular room for my Man Cave. Similar to the Man Cave in our previous house, it would have many functions – it would house my computer, and all my musical kit, and would double as a spare bedroom when we had guests. However, this one also had the benefit that it did not share a wall with a neighbour, making it even better suited to musical uses. However we soon realised that it was not really efficient use of space. Given that Karen worked a lot from home, it was crazy to have this room going unused all day while she had need for a desk. So we changed the plan a bit, and instead of buying a sofa bed for the Man Cave, we got a shelving unit and a filing cabinet and kept the desk that the previous owner left behind (and bought an Ikea Jerker for my computer). As the years have passed, our needs have gradually evolved. In that first year Karen had a desktop computer, and so used the desk on a near-daily basis. In the 7th year we replaced it with a fairly bulky laptop, which made her a bit more mobile. Finally, this year, she traded up to a much more svelte laptop, and it reached the stage where she never actually sat down at the desk, preferring to use other rooms in the house for work. We have therefore performed some furniture replacement and relocation to accommodate this new style of working, with the consequence that the room has now been restored to its early designation of Man Cave. Granted, it’s still in a bit of a transitional phase at the moment, but we’ll get to where we need to be. It’s quite exciting. I might even buy some more guitar wall hangers. I love canals. You may already know that about me. But if not, then maybe we should spend more time together. Another thing I love is new transport routes. When I see a new road, I have to drive along it. It’s like a compulsion. Earlier in the week I found myself getting elbow deep in information about the Wilts & Berks Canal Restoration project. Here’s some useful canal background for you. 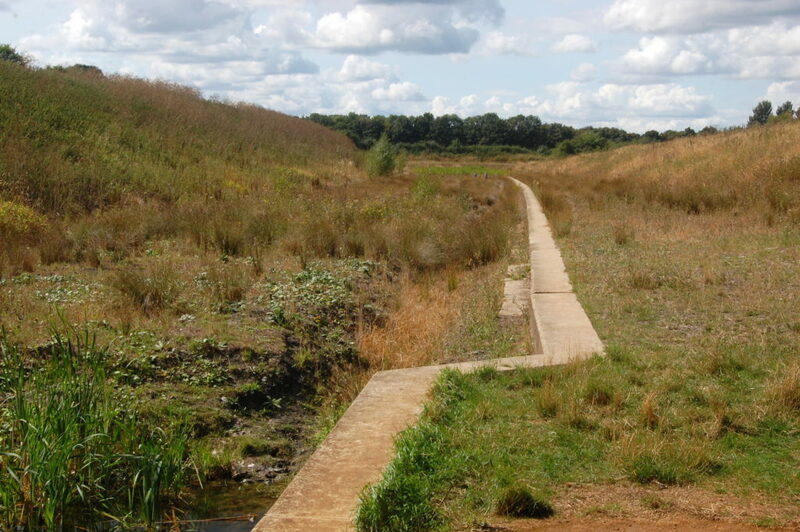 The modern British canal network came into being during the Industrial Revolution in the mid-18th century. It was far and away the most efficient way to transport large quantities of goods and resources. 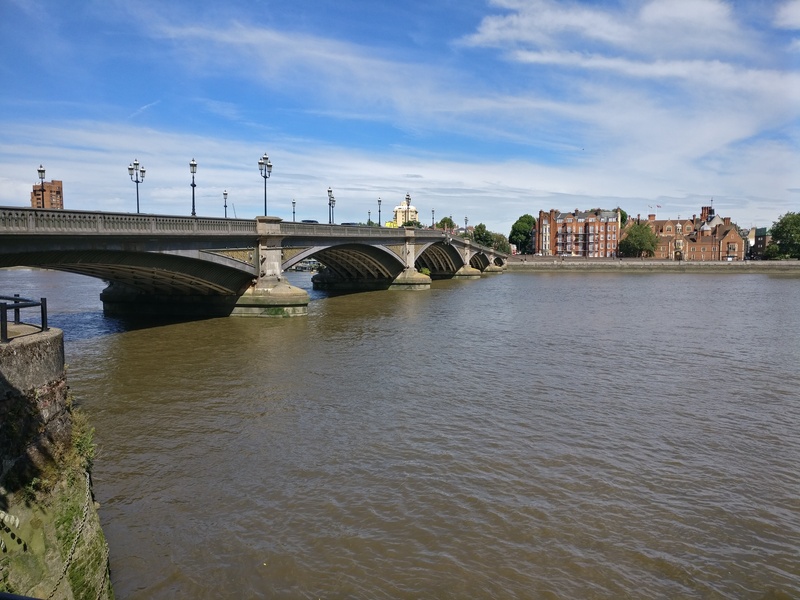 Their golden era was brief, however, as the introduction of the national railway network in the 19th century gave them serious competition, and the canal network started to decline. By the mid-20th century, the canals were all but defunct, and mainly used as a dumping ground for bodies and shopping trollies. 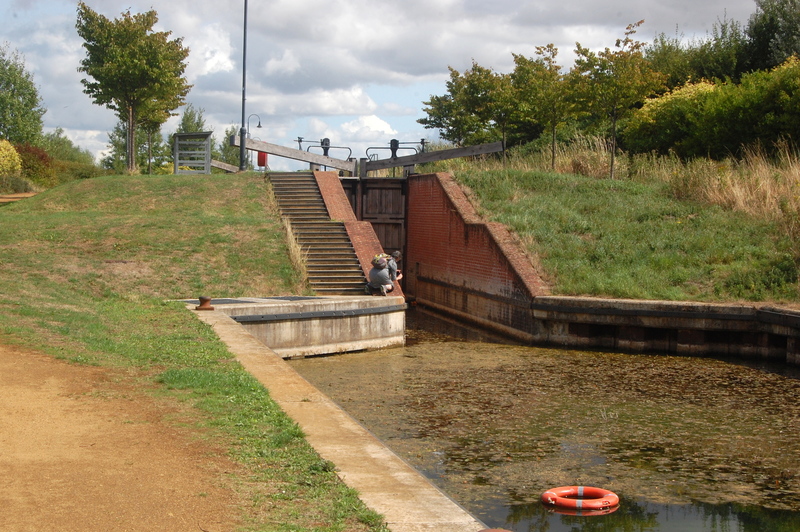 The W&B canal was opened in 1810 and connected the Kennet and Avon Canal at Semington (a few miles east of Bath, for those who are unfamiliar with the area) to the Thames at Abingdon (just south of Oxford). 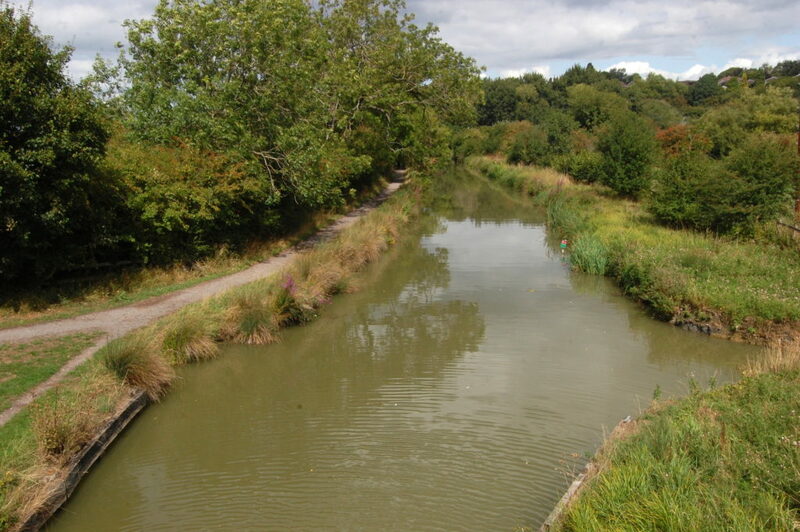 There was also a branch, called the North Wilts Canal, which forked off from it at the small market town of Swindon, and travelled north to Cricklade. Over the next 100 years, the canal wasn’t terribly successful, mainly owing to competition from the railways. That little market town of Swindon continued to thrive though. 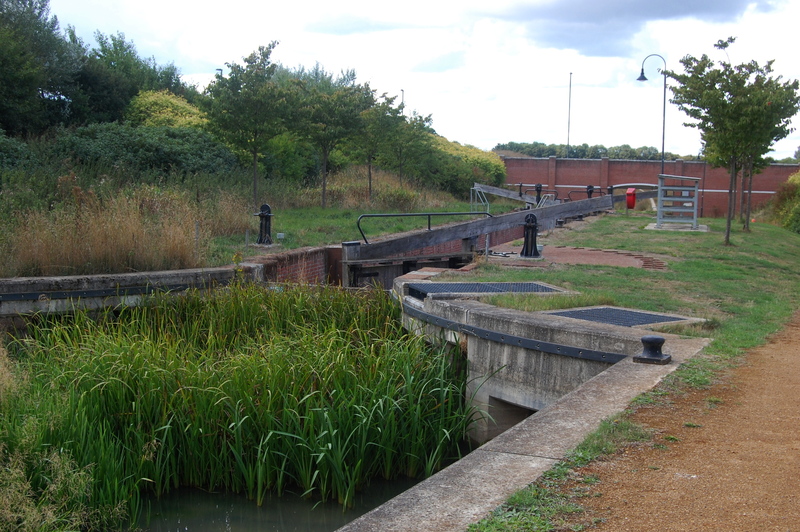 In 1914, the canal was formally abandoned, and most of the length running through Swindon was gradually filled in and built over. 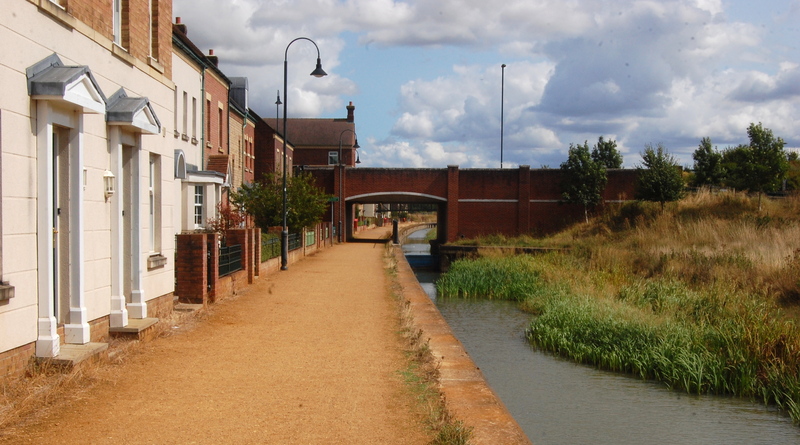 In more recent times, various canal restoration projects around the country have demonstrated the value of bringing defunct canals back online. 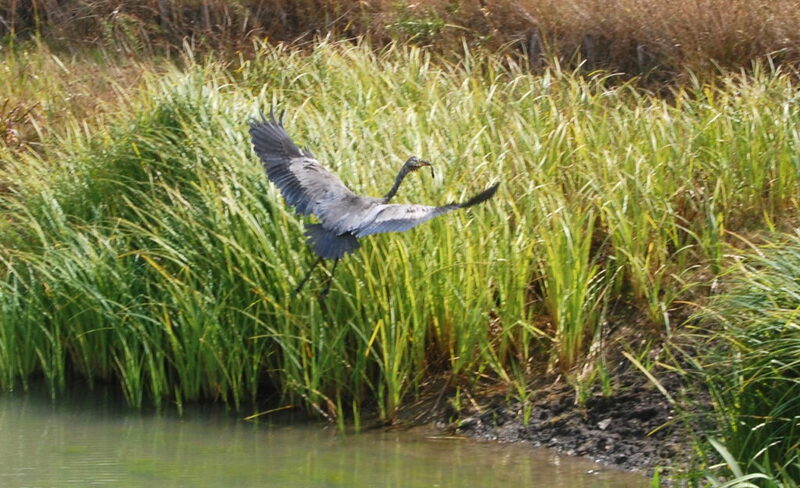 If well-maintained, they provide a wildlife habitat, tourism opportunities, and desirable locations for housing. The W&B is no different, and the plan is to have the bulk of the canal restored and navigable over the next 10-15 years. 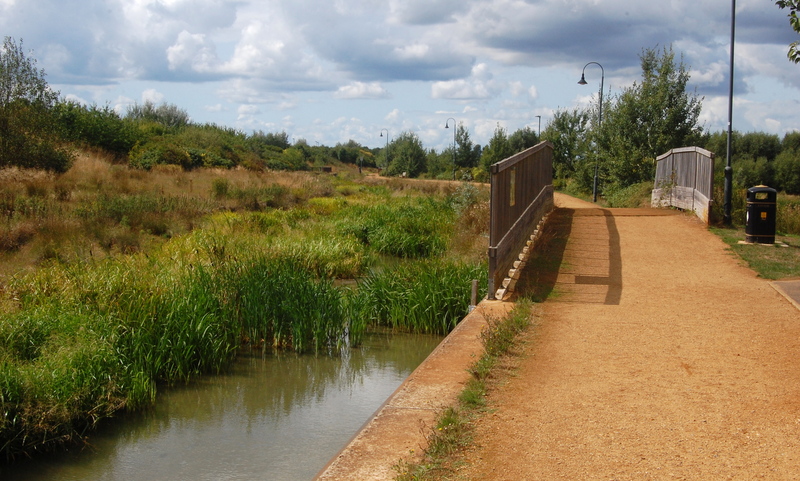 For the most part, the canal can be restored along its original route, but Swindon is a tricky spot. 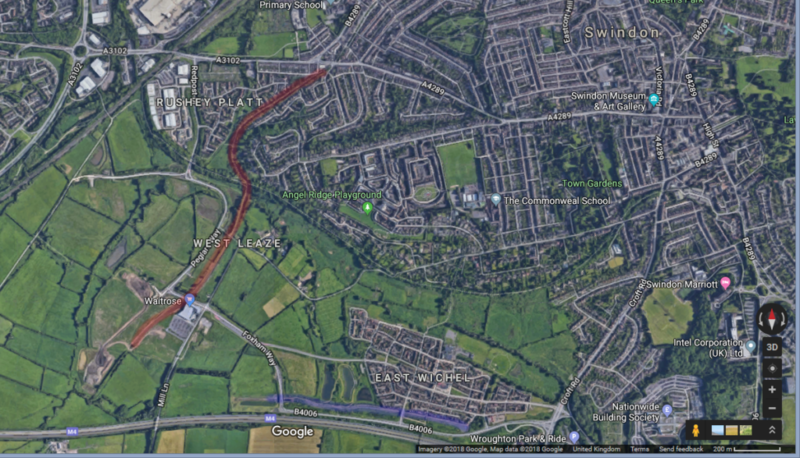 Since it’s obviously not feasible to demolish a stripe of buildings through Swindon town centre, the plan is to build a sort of canal bypass around the south and east sides of the town, that links to the original course at its ends. When I found out about this, I pretty much pissed myself with excitement, and sent Karen a message saying “We all need to go to Swindon some time.” I mean, canal restoration is pretty cool, but building brand new canals from scratch? That’s epic. 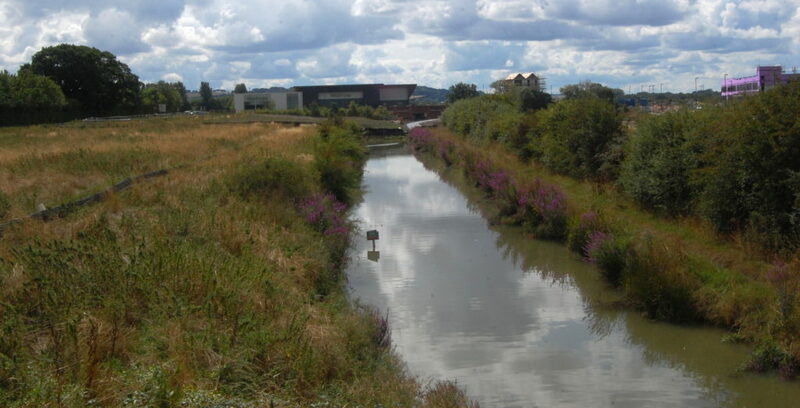 There were three sections of the canal development around Swindon that I was interested in seeing for myself. Time for a little map. The red highlighted stretch you see here is the “surviving” stretch. If you compare this satellite image to one from 2002, the canal itself looks more or less the same. 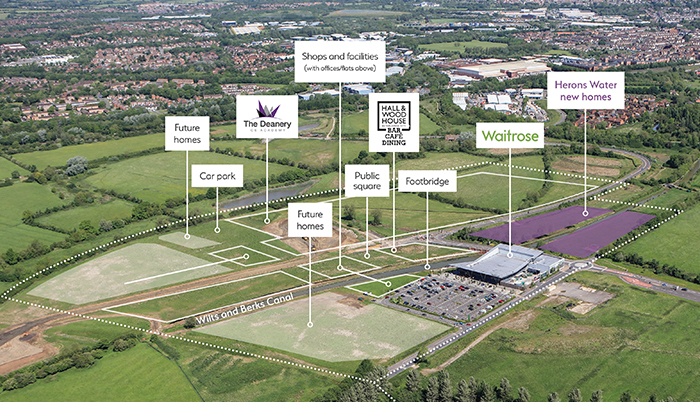 However, the Waitrose is new, and this area on the whole is under very active development. The blue highlighted stretch at the bottom, and all the houses around it, are about ten years old. 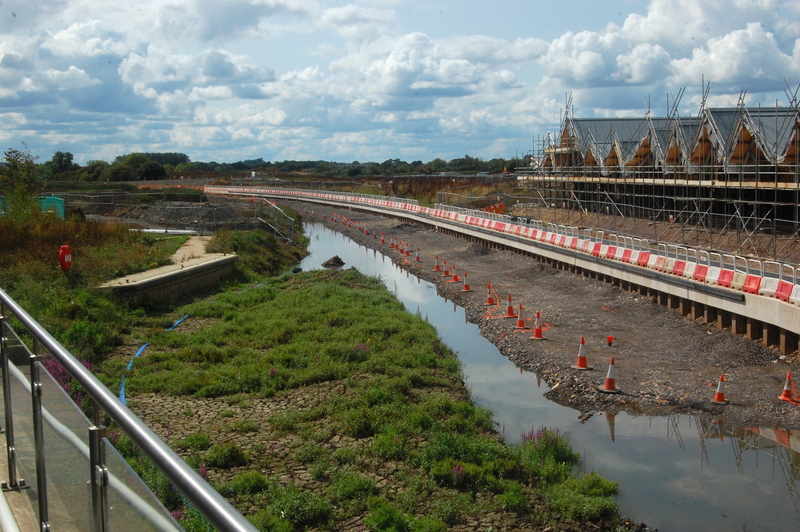 This is the first completed section of the new canal route around Swindon. See that zig-zag grey/brown stripe running parallel to the A419? It seems to follow the proposed route of the new canal. I wanted to go and see it for myself. So we jumped in the car and went on our way. We got waylaid en route, and checked out Butterfly World first, but this isn’t a blog post about butterflies, so if you really want to know more about that then leave a comment. After lunch, we drove up to the new Waitrose and cheekily used their car park. It’s clearly very shrewd of Waitrose to get in so early on this development. When this is all done, you’ll be able to sit on the Waitrose cafe terrace on the east bank, or outside the pub on the west, and watch the narrowboats pootle by. I think it’s going to be a really nice area to be. We couldn’t walk south from here, as it was a construction site, so we wandered to the north a little bit. We crossed the main road, and I took this photo from the bridge, looking north. Look at that lovely new towpath, couldn’t you just lick it? …and the second looking north. I would have loved to continue walking along the tow path here, and in ten minutes we would have reached the end of the canal, but Bernard was in one of his not wanting to walk moods, and so we had to go back and pick him up from the side of the road that he was sulking by. We then took the car to my blue highlighted section at East Wichel, to avoid straining Bernard with the terrifying prospect of a 15 minute walk. After grappling for many minutes with contradictory signs about car parking, we eventually parked up and approached the canal. In the ~10 years since this canal was built, it does seem to have lost a little of its shine. I guess it’s a combination of various factors – there’s no boats travelling on it, so weeds will tend to proliferate. It’s also a static body of water that doesn’t, as far as I can see, have any source feeding it, so the level does seem very low. I guess that once it’s linked up to the rest of the network, they’ll give it a quick tidy up and a desilting and it’ll be hot to trot. These are quite nice little houses – the developers have eschewed standardisation, and used a mix of materials and designs, to give the effect of organic growth over many centuries. I must say it’s very effective. The one thing I will say against them – if I was buying a house by a canal, I’d want one where the back garden adjoins to the canal, so I can tie my own boat up at the bottom of my garden. Earlier in the week Karen and I were walking along the river Kennet and looking at the backs of the houses along Elgar Road, and really getting quite envious. This photo shows the extent of the canal at East Wichel so far. 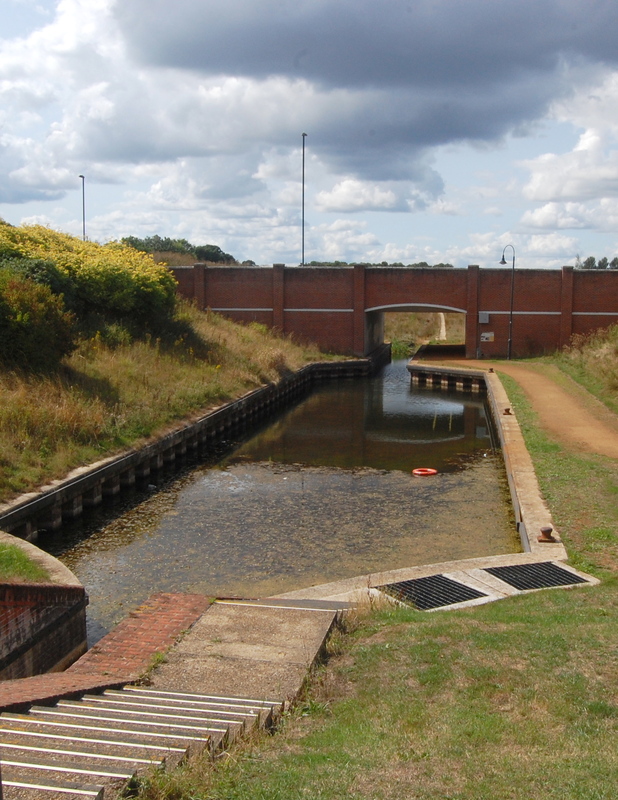 At its eastern end, there’s a nice wide basin, the canal squeezes under a bridge, and then just stops. For now. Looking back west along the East Wichel stretch of canal. We then retraced our steps and explored the western half of this stretch. Bernard was in a strop again, so he sat down while Karen and I went on ahead. I liked that this sign was already in place, despite the fact that it will probably be a long time before this waterway sees any traffic. We then stumbled upon a lock! Again, it’s one of those accoutrements that seems to have been added a bit prematurely, since the canal peters out soon after this point, but it was still fun to explore. Since it was dry, we could peer down into the depths (and deep it sure was) and also see inside the cavities where the paddles are, which one doesn’t normally get to do, as they are submerged. Couldn’t get a good photo of it, unfortunately, so here’s two photos of the lock looking from the east and west respectively. 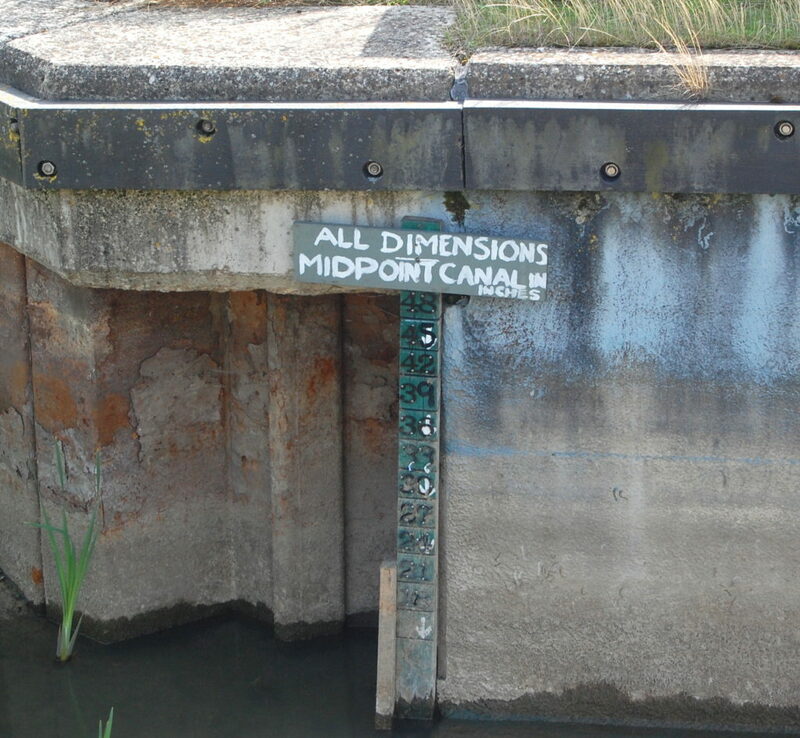 Beyond the lock, the canal goes under a bridge and then just abruptly stops. The edging stone is in place, but the actual channel has not yet been excavated. Again, had time permitted, I would have continued walking along this path to see how close I could get to the new development near Waitrose, but I felt like we had to get back to Bernard. On our way back, we saw a heron stood in the water. We stalked up to it quietly, and witnessed it pluck a fish out of the canal and fly away with it in its beak. Hey Pete, what about that other bit? You know, the zig-zag stripes by the A419? Ah, I was hoping you’d forgotten about that. We drove over, but could see nothing. Just fields. I have no idea what was going on there – maybe the satellite photos were taken while they were doing some exploratory excavation, and the fields have now grown back over. I was a little disappointed at that – I was kinda hoping I might see a new channel in the process of being scooped out. In hindsight, I’m glad we saved this section for last – if we’d gone there first, and seen nothing at all, it would have seriously dampened our enthusiasm. If you’re interested in continuing to follow the redevelopment of the Wilts & Berks Canal, their twitter account is a great place to start – @wiltsberkscanal. Halfway through today’s walk I theatrically slapped my forehead when I realised that I had forgotten to post my regular morning photo! We weren’t quite able to attain our day 2 goal of reaching Canary Wharf, and instead had to be happy with Wapping. On the plus side, that left us more time for drinking with friends, so all in all I’d call it a victory. Of course, being two miles short on Saturday left us playing catch up today. With a deadline to be home by, we knew there was little chance of reaching the barrier, and indeed it seemed more likely that we’d end up losing another two miles. But impressively we didn’t, putting us in the situation of finishing the day’s walking at the Dome with two miles left to the barrier. It’s a small shame to come so far and not finish the job, but the silver lining is that we can go back with Bernard and enjoy those last two miles together. So, status update. We made good progress yesterday and successfully covered half of the distance to the barrier. Which would be good, apart from that we both sustained some degree of injury from trying to do such a large distance without sufficient training. Right now, the target of reaching the barrier by the end of tomorrow is in jeopardy. Let’s see how it goes.